Crop wild relatives are wild plant species that share a common ancestor with cultivated crops. They retain a level of genetic diversity that makes them an invaluable source of raw material for crop improvement. However, their availability for research purposes depends on the coverage and state of the germplasm collections maintained by genebanks. 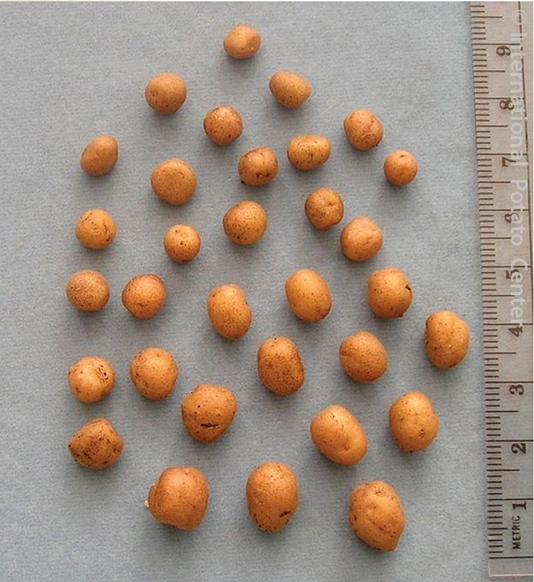 Large numbers of wild potato species from Peru, the center of potato genetic diversity, are actually absent from these ex situ collections and should be categorized as “high priority” for further collecting, according to a new research published in PLOS ONE journal. “Crop wild relatives have evolved under natural selection in their native range coming to be adapted to specific conditions such as high temperatures, salinity, and assorted pests and diseases,” explains Nora Castañeda-Álvarez, the lead author and scientist at CIAT’s Crop Wild Relatives (CWR) research team. “Such traits can be bred into crop plants, greatly benefiting agricultural production, but only if these germplasm resources are made available to breeders,” she adds. In the case of potato, one of the world’s most important food crops grown in over 125 countries, some wild species are sources of valuable traits offering resistance to frost and late blight, one of the most devastating potato diseases worldwide. The tuber crop has proven to be vulnerable to climate change, with growing areas moving upwards in the Andes, and a potential increase of pests and diseases due to rising temperatures. Habitat destruction is a main threat for continued in situ conservation of the potato’s CWR, particularly given the fact that many of them are highly endemic. Under the umbrella of the CGIAR Research Program on Roots, Tubers and Bananas (RTB), scientists of the International Potato Center (CIP) and the International Center for Tropical Agriculture (CIAT) have collaborated and analyzed the state of ex situ conservation of 73 of the closest wild relatives of potato (Solanum section Petota): a “gap analysis” aimed to critically analyze the present-day representativeness of public genebank collections globally, determine high priority geographic areas for collecting CWR in order to fill the gaps in genebanks, and also to identify species that need attention for in situ conservation monitoring. Significant gaps were found in global ex situ collections: in order to address them, a total of 32 species (43.8%) were consequently assigned high priority for further collecting. Species completely lacking representation in germplasm collections, specifically ayacuchense, S. olmosense and S. salasianum in Peru and S. neovavilovii in Bolivia. Other high priority species, with geographic emphasis on the center of species diversity, specifically 28 species that are currently present yet severely underrepresented in genebanks. According to the authors of the study, such collecting efforts are key steps in ensuring the long-term availability of the wild potato genetic resources. They should also be combined with increased efforts to improve ex situ conservation technologies and methods, perform genotypic and phenotypic characterization of wild relative diversity, monitor wild populations in situ, and make conserved wild relatives and their associated data accessible to the global research community. “In times when new collection expeditions are difficult to conduct, climate change is a reality and habitat destruction is widespread, it is essential that in situ reserves are established,” says second author Stef de Haan. “In situ conservation is complementary to genebanks and can support ongoing evolution and adaptive shifts in population genetics,” he asserts. This entry was posted in News and tagged crop wild relatives, potato on Apr 29, 2015 by RTB.